Our Company USB Christmas Santa Flash Drives are and excellent and very useful promotional item to give away to your staff and customers this Christmas. As each of the Company USB Christmas Santa Flash Drives come ready branded with your company details and logo, they will help you to stay promoted in these times of high competition. Available in sizes 256MB, 512MB, 1GB, 2GB, 4GB, 8GB and 16GB. To find out more about our Company USB Christmas Santa Flash Drives click here and fill in the contact form and we'll get straight back to you. 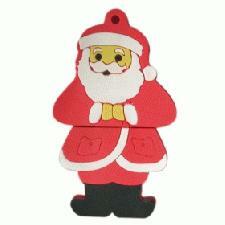 Other promotional and personalised items besides our Company USB Christmas Santa Flash Drives click here.